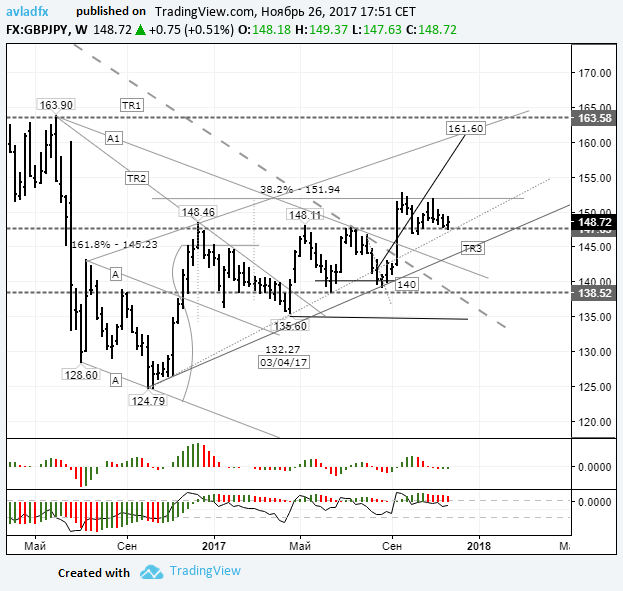 The previous idea on the GBPJPY currency pair was published on the 14th of August. At press time, the British pound was trading at 142.02 against the yen. Moving from the trend line, the pound was expected to rise with an initial target of 147.81 by the 20th of September (see chart below). Despite the false breakout of the trend line, buyers managed to bring the price up to this level by the 7th of September. The technical picture changed slightly after the false breakout. Growth petered out at around 152, which is the 38.2% Fibonacci level from the downwards movement from 195.86 to 124.79. 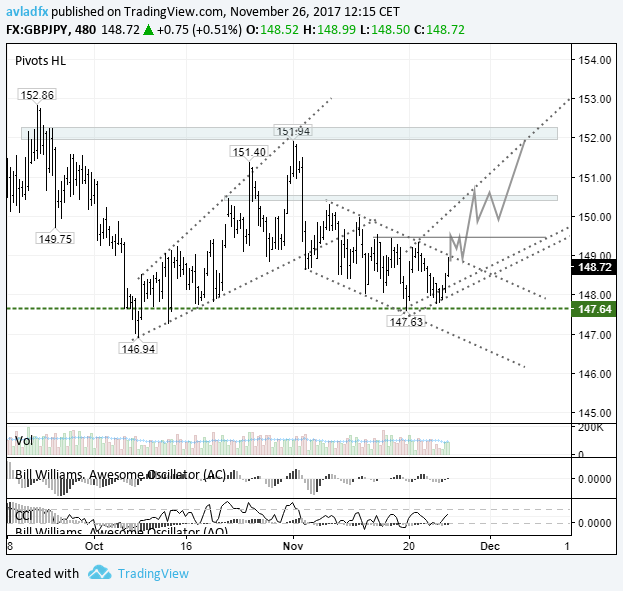 Since breaking 147.82, the next target is 161.60. The TR3 trend line has undergone a correction through 139.31 level and the support currently runs through 144. The pair has been trading inside the downwards channel since the 2nd of November. On Friday, the pound rose to the upper boundary of the channel as the US dollar declined and traders’ appetite for risk increased. Considering that the price has rebounded from the support zone of 147.64/80 (see weekly chart), I’m expecting the price to exit the channel, breaking 149.50 and continuing to 150.50. If Brexit talks go smoothly, we could see quotes rise to 151.00 – 152.00.